If you've been following along with us since the BlackBerry PlayBook rumors started, then the name TAT (The Astonishing Tribe) will be a familiar one. If it's not ringing any bells, then we'll just say they are now most commonly known for developing portions of the BlackBerry PlayBooks user interface -- except, this information is slightly misdirected. As it turns out, TAT's involvement in the BlackBerry PlayBook UI is starting to look rather minimal compared to the involvement of Teknision -- an Ottawa, Ontario, Canada based firm. One look at their site reveals a lot about the company and their involvement in the User Experience Design within the BlackBerry PlayBook. The BlackBerry Tablet OS is a completely new user experience direction for BlackBerry, which will eventually extend to all RIM devices. The PlayBook engagement resulted in several patents and near unanimous industry acclaim. 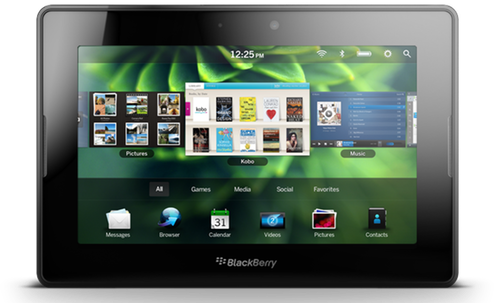 Teknision also played a big part in building of the BlackBerry PlayBook applications such as, the PlayBook Photo and Music app as well as the BlackBerry PlayBook SDK. Looking at their statement above, it's pretty clear they will be looking to scape down the PlayBook designs to BlackBerry Smartphones. I for one, can't wait to see what they'll be able to come up with -- but it does beg the question on whether or not we'll see more influence from TAT or Teknision in the long run or will it be an amazing mix of both teams coming together to create one simply awesome UI -- time will tell I suppose but in the meantime, we'll be waiting for our PlayBooks so we can enjoy the work. Hit up their site for some of the finer details.